1. I just bought a subscription, but I cannot sign in using the subscription number. Please advise. Thank you for purchasing your membership. 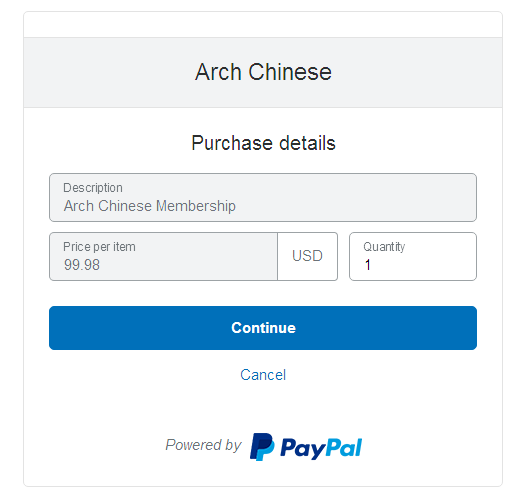 You should have received two emails, a payment confirmation email from PayPal and a welcome email from Arch Chinese. In the welcome email, you can find your member serial key along with sign-in instructions. You should use the member serial key, not the subscription number, to sign in. It is strongly recommended that you copy and paste the member serial key into the serial key box when you sign in. 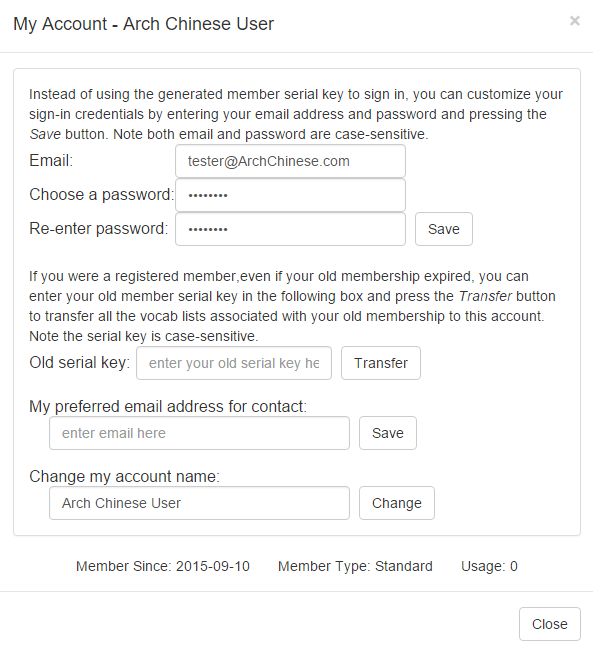 If you have not received the welcome email from Arch Chinese, you can check your email spam folder. Your email spam filter might have placed the email there. If you cannot find the welcome email in your spam folder either, please contact us. 2. I have created a password but when I try to log into my iPad, it is rejected. The same password works fine on my desktop. Can you help me? 3. I am not able to stay signed on. It logs me out after I click on a different link. Please advise. This is because your browser's cookie functionality is turned off. You will need to turn cookies on to stay signed on. If you are using an iOS device, you need to turn off private browsing. 2. Click on "Tools" --> "Options" and click the "Privacy" tab. 3. Make sure the option "Accept cookies from sites" is selected. 3. Scroll down the page and click on "Show advanced settings". 4. Under "Privacy", click on the button "Content Settings"
5. Under "Cookies", make sure that "Allow local data to be set (recommended)" is selected. 4. I can't seem to log in. It keeps telling my my serial key is invalid. Can you fix this for me? You will get that message when your membership is exipred or you have entered an incorrect serial key. You can restart your browser, copy and paste your serial key into the serial key box and hit the "Sign In" button again. It is strongly recommended to copy and paste it into the serial key box when you sign in. If you just signed up, do not use the PayPal subscription number to sign in, use the serial key included in the member welcome email instead. If you got the message when you were trying to sign in using your email and password, it's likely you entered an incorrect password or email. If you forget your password, you can always sign in with your member serial key, leaving the email and password fields blank. If you still cannot log in, most likely your membership is expired. You can simply go to the membership page to sign up for a new membership. 5.On the "Worksheets" page, When I hit the "Print" button, the system prompts me to sign in, but how to sign in? The sign-in link is on the upper-right corner of the page. Before you hit the Print button, click the "Sign In" link to enter your member serial key. It is recommended to copy and paste the serial key into the serial key box when you sign in. After you sign in, the system remembers you for a certain period of time. You need to make sure to sign out if you are using a public computer in libraries, cafes or schools. Once you have signed in with your member serial key, you can create your own, easy-to-remember sign-in credentials via the "My Account" link, which is available at the top of the page after you sign in. If you forget your email or password, you can always sign in with your member serial key (leaving the email and password fields empty) and reset your email and password. 6. I can log in from my computer, but when I click on "Sign In" link on my iPad, nothing happens. Please advise. Tap on Website Data. Scroll to the bottom again and tap on Remove All Website Data. Once the browser cache is cleared, you should be able to log in after you point your browser to Arch Chinese. 7. 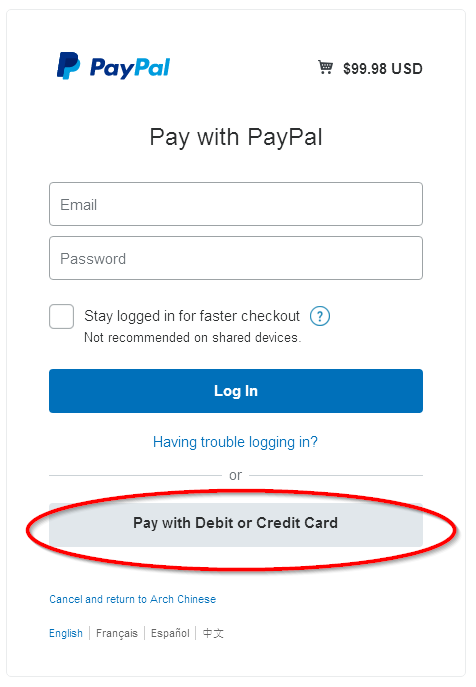 Your website seems to require a PayPal account in order to complete payment, but as a U.S. Government purchaser, I am not allowed to use PayPal. Can you please advise if there is any way around this problem? you will see a One-time Purchase option. Select the type of the membership you would like to purchase and click the Buy Now button. Change the membership quantity from the default value 1 to the number of memberships you would like to purchase. Hit the Continue button. On the payment screen, select the Pay with a Debit or Credit Card button to follow the instruction and finish the payment process with your credit card. For international customers, we also accept wire transfers. Contact us for wire transfer details. 8. Does your company accept purchase orders? Yes, we do. If your business or accounting department needs a current W-9 form, please contact us. Once your purchase order is approved, you can scan it and email it to us. We will create an account for you right away and email you back with the account access key along with your membership invoice. You can start to use our system before the payment is processed! 9. How can I renew my membership? to sign up for a new membership. If you have vocab lists saved on your old account, you can refer to question #20 on this page to transfer them from your old account to your new account. Note that you may renew your membership prior to your membership expiration date or anytime after your membership has expired. 10. 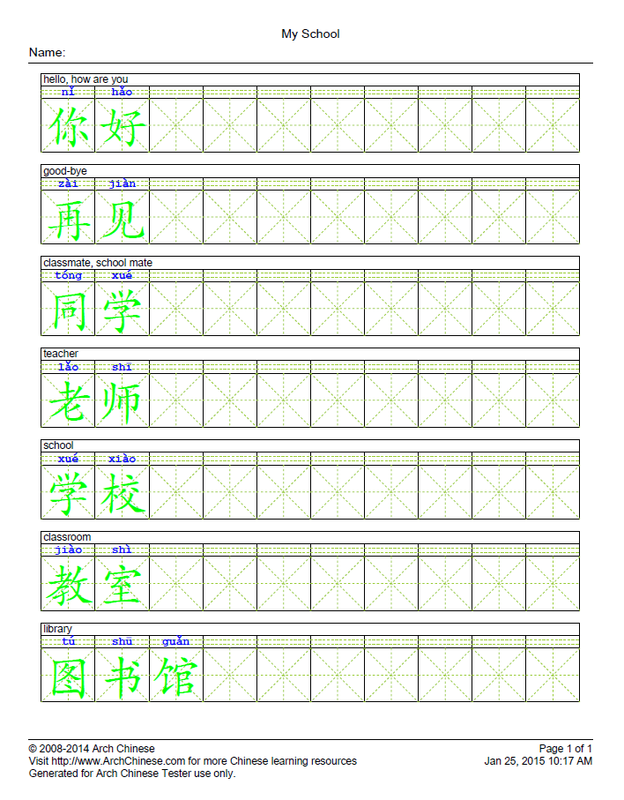 How to generate Chinese character writing worksheets? 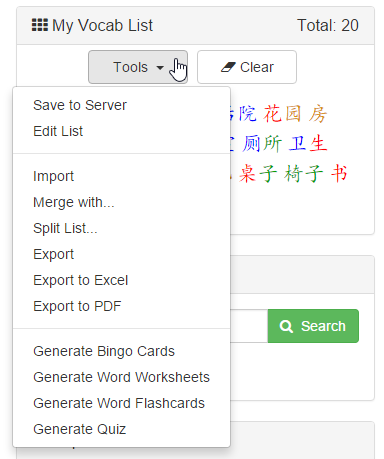 The quickest way is go to Chinese Character Worksheet page, enter (or copy and paste) some Chinese characters into the character box and hit the Customize button to review and edit the system provided definitions. Once you are OK with the Pinyin and definitions, click the Print button to generate the worksheets. The character worksheets are highly customizable. Even though the sensible default settings work for most of the cases, you can scroll down to the Worksheet Settings section to tweak the worksheet settings to meet your needs. The Reset link allows you to reset the worksheet generation settings to the default values. The system can remember your last-used settings, even if you switch to a different browser or machine. Note that this site uses a pop-up window to display the generated worksheets. If your browser is configured to block pop-ups, you will need to allow https://www.archchinese.com and https://service.archchinese.com to open pop-ups. 11. How to use the vocabulary in the dictionary to create flashcards or worksheets? Click the "Tools" button to view the tools you can use with the vocabulary in the list. Your "Temp Vocab List" is automatically saved on Google cloud. So your data is always safe and secure. Once you are done with the list, press the "Save" button to add it to your "Saved Vocab Lists", which maintains all the vocab lists you have created. 12. I am trying to generate a worksheet, but when I click the "Print" button, my browser shows a progress bar for a while and does nothing. Is there anything else that I need to do to make this work? If your browser is configured to block pop-up windows, you need to configure it to allow pop-up windows from https://www.archchinese.com and https://service.archchinese.com. The generated worksheet will be shown in a separate tab or window. If you have installed third party applications, including browser add-ons and extensions, to block pop-ups, you may need to check the vendor documentation to allow pop-up windows from the two sites. 13. I am a Chinese teacher. How can I quickly create character worksheets for my students? 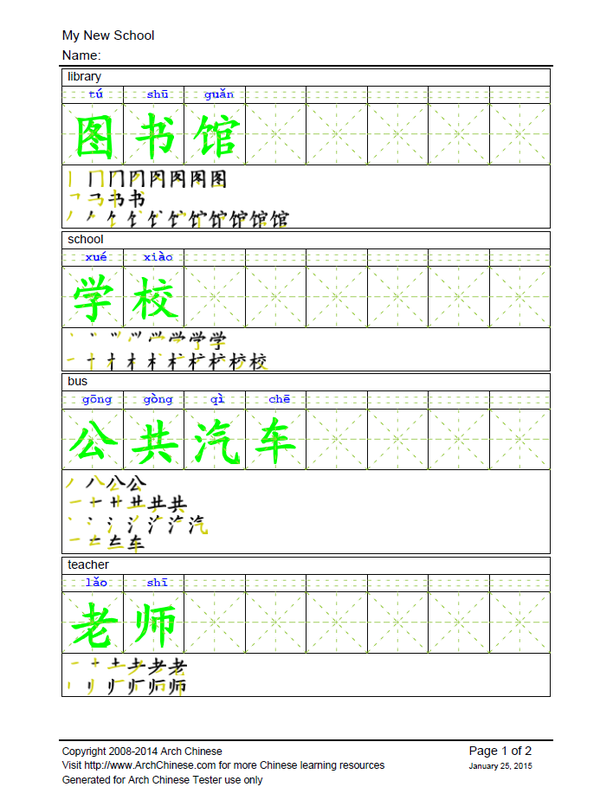 Both the Chinese character definitions and worksheet styles are customizable. If you leave the character box blank, the system will generate a general-purpose blank character worksheet for you. You can still customize page layout, grid size and style, etc. You can even allow the system to generate a blank worksheet on which only the bottom half of the page printed writing grids, leaving the top half of the page blank so that young kids may use it to draw pictures or anything they like. Note, to generate this type of worksheets, you must enable the option "Draw writing grids only on the bottom half of the page (applies to blank worksheets only)" and blank out the characters in the character box. For performance reasons, you can print max 50 characters at a time. If you need to generate more characters at a time, you can sign up for a premium member. Among other premium member only features, you can generate worksheets for more than 100 characters at a time. 14. Some repetitive words disappeared when I tried to create character worksheets. For an example 时间时候, only one 时 appears in the worksheet. Why? 12. Show repetitive characters in the worksheet. 15. I am learning both traditional and simplified Chinese characters. If I become a member, can I generate worksheets for both styles? Yes, once you becomes a member, you can generate worksheets for any characters defined in the national standard character set of China and over 8,000 traditional Chinese characters. 16. I know how to make Chinese character worksheets. Could you tell me how to make Chinese word or phrase writing worksheets? Both tools are listed on the Chinese Tools page. The first tool is much faster. If you do not want to show the stroke sequences on the word worksheets, it is strongly recommended to use the first one. The second tool is slower because of the extra time needed to generate the character stroke sequences. 17. I would like to print flashcards like the ones shown on your home page. These flashcards include the Chinese character, explanation of the character, pinyin with tone, and the English translation. Could you please provide me with step by step instructions? Enter (or copy and paste) Chinese characters into the character box. Optionally, click the Customize button to review and edit the definitions and Pinyin of the characters. The flashcard PDF file will be shown in a separate window instantly. If your browser is configured to block pop-ups, make sure it allows pop-ups from www.archchinese.com and service.archchinese.com. 18. I got a message saying "you do not have enough credit to print characters, please contact customer support". Why? To provide a superior user experience to all the users, we have put a cap to avoid users to generate unusual large amount of worksheets in a very short period of time. That means, unless you have generated worksheets for thousands of characters, you should not see that message. If you did get this message, let us know. We will resolve this issue for you quickly. 19. Can I use my own English definitions for the characters and words on the worksheets? Yes, you can provide your own English (or other language) definitions and Pinyin for any characters in the system. 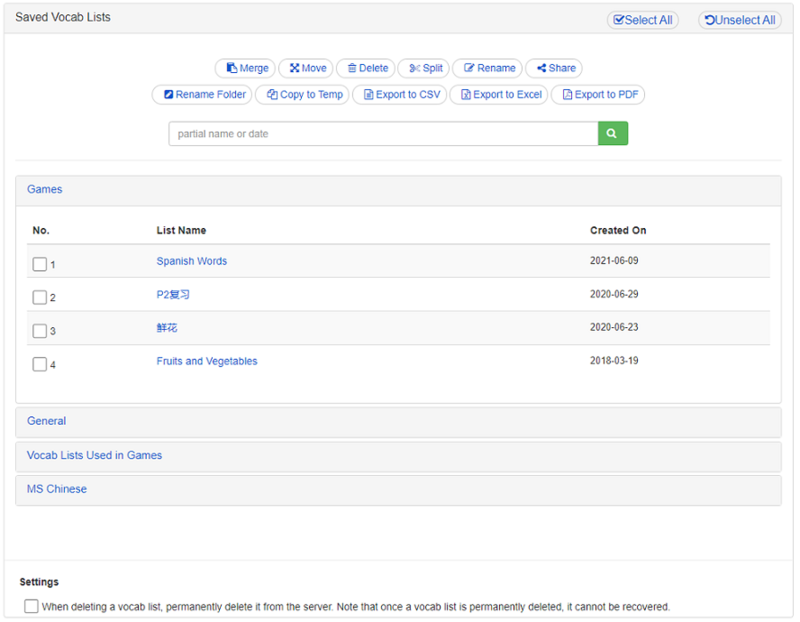 On the Chinese Worksheets page, the Customize button allows you to review and edit the system-provided definitions. 20. I just renewed my membership and received a new member serial key instantly. But I had many vocabulary lists saved on my previous account. How can I access them? Sign in using your new member serial key or email and password if you have created your own sign-in credentials. After signing in, you should see a "My Account" link at the top of the page. Click the link to bring up the "My Account" view. At the bottom of the "My Account" view, you will see an "Old Serial Key" input box and a "Transfer Vocab Lists" button. Enter (or copy and paste) your old member serial key into the box and hit the "Transfer Vocab Lists" button. (Note your old member serial key can be used to transfer vocab lists only. The account associated with your old member serial key is inactive). Log out and log in again to view your updated vocab lists, which are listed on the right side of the page. 21. I have created and saved many vocab lists on your system. Can I create folders to organize my saved vocab lists? Yes, you can create folders to organize your vocab lists. For the users who have not created a folder, all your saved vocab lists are placed in the default General folder. Click the Manage button on the title bar of the Saved Vocab Lists box to bring up the "Manage Vocab Lists" page. On the "Manage Vocab Lists" page, select one or more vocab lists and click the Move button to move the selected lists to a different folder. 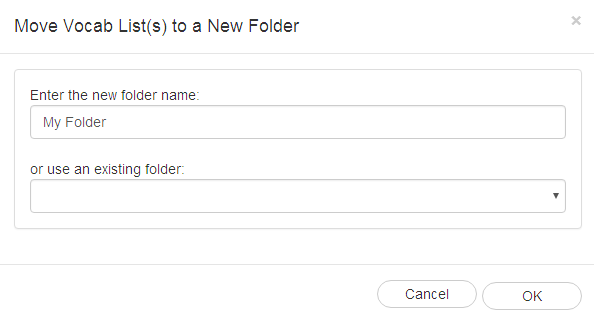 You can enter a new folder name or use an existing folder. 22. Can you tell me how to merge two vocab lists into one? Our system allows you to merge two or more vocab lists into one and split one vocab list into two. 1. Click the Manage button on the title bar of the Saved Vocab Lists box to bring up Manage Vocab Lists page. 2. One the Manage Vocab Lists page, select two or more vocab lists and hit the Merge button to merge the selected vocab lists. 23. How can I delete a vocab list I created? 2. 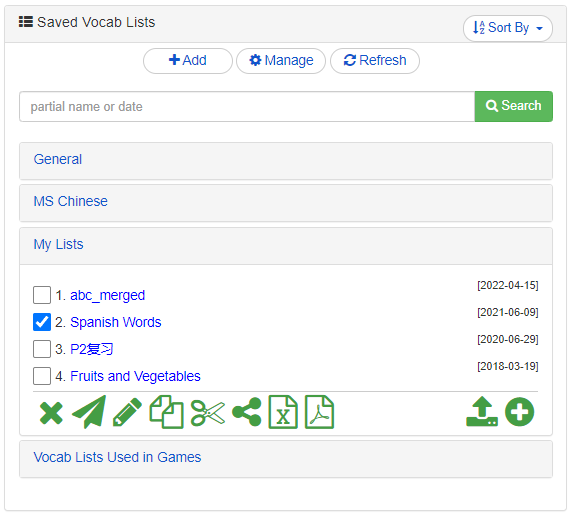 One the Manage Vocab Lists page, select one or more vocab lists and hit the Delete button to delete the selected vocab lists. 24. I have a big vocab list. I would like to split it into two. Can you tell me how? 2. One the Manage Vocab Lists page, select one vocab list and hit the Split button to split the selected vocab lists. The two new lists will be placed in the "General" folder of the "Saved Vocab Lists" box. 25. I'd like to rearrange the words in the vocab list I created. Is there an easy way to do this? Yes. 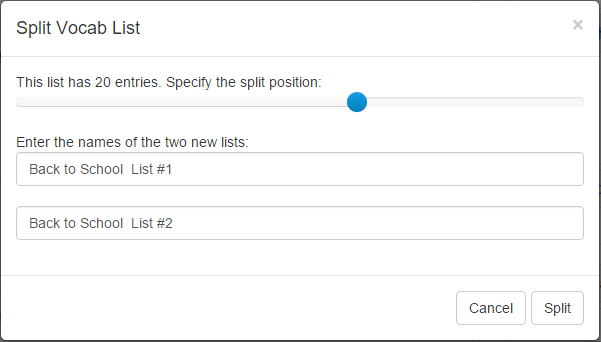 As shown below, when you are creating a new list or editing an existing list, you can click the gear drop-down button on the upper-left corner to select a tool button to use. From the drop-down menu, select the Move Up or Move Down option. Click the arrow button to move the word up or down. Make sure to save the list after you are done editing. 26. I am a Chinese teacher. How can I make my vocabulary lists accessible to my students so that they can practice the characters I want them to work on? As a teacher, you can create vocab lists and share them with your students so that they can view the animated stroke order, practice writing online, review them using the online flashcard program and play memory game. You can post the shortened URLs on your social media or class web pages to share the list with your students. Your students do not need an Arch Chinese account to use the vocab list. Another way to share the lists with others is to use the Find a Vocab List search box, which is right below the Temp Vocab List box on the right sidebar. Your students can search your vocab lists by list name, an English word in the list, or simply your name. 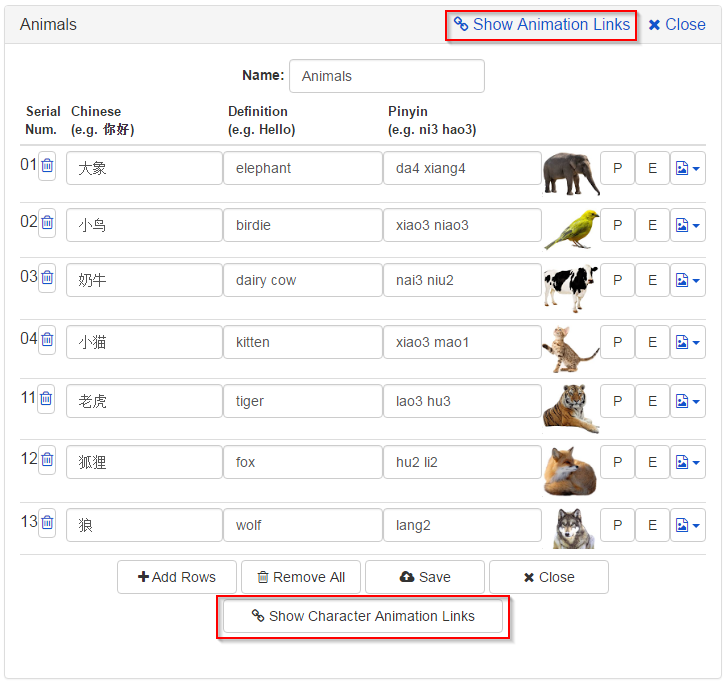 To view the character stroke order animations, your students need to load the list from the search result and click the Animation Links hyperlink on the title bar to display the hyperlinked Chinese characters. Click the hyperlinked characters, one by one, to view the stroke order animation and details of the character. 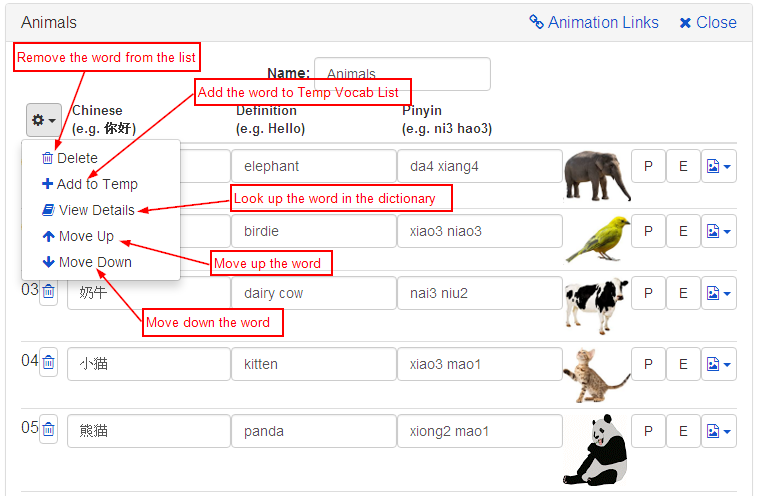 Your Students can use the same approach to find a list created by you and load it into the Chinese Flashcard program to review them, practice writing online with our unique Chinese Handwriting Practice tool or learn by playing memory game. 27. How can I export a Chinese vocabulary list I created? You can easily export a vocab list to share with others or use it in a third party tool. As shown below, there are a few tool icons next to each Saved Vocab List. Click the Copy icon to copy the list to Temp Vocab List. Temp Vocab List box is right below the Saved Vocab Lists box on the right sidebar. Click the Tools button in the Temp Vocab List box and select the Export menu item to export the list to the text box in a format that you choose. You can also select Export to Excel to export it to an Excel file or select Export to PDF to export the list to a PDF file. 28. My school purchased a membership for me. Can I change the name and contact email of the account? Yes, you can change the account name and set the preferred contact email of the account. After you sign in, you will see a "My Account" link at the top of the page. Click the link to bring up the "My Account" dialog to change your account name and set your preferred contact email. 29. I like the color-coded tones on your site, but our school uses a different color scheme. What should I do? Thank you for checking with us. The tone color scheme on our site is customizable. You can change the color scheme to match your school's or simply turn off color coding for the tones. 1. Point your browser to the Chinese English Dictionary page. 2. 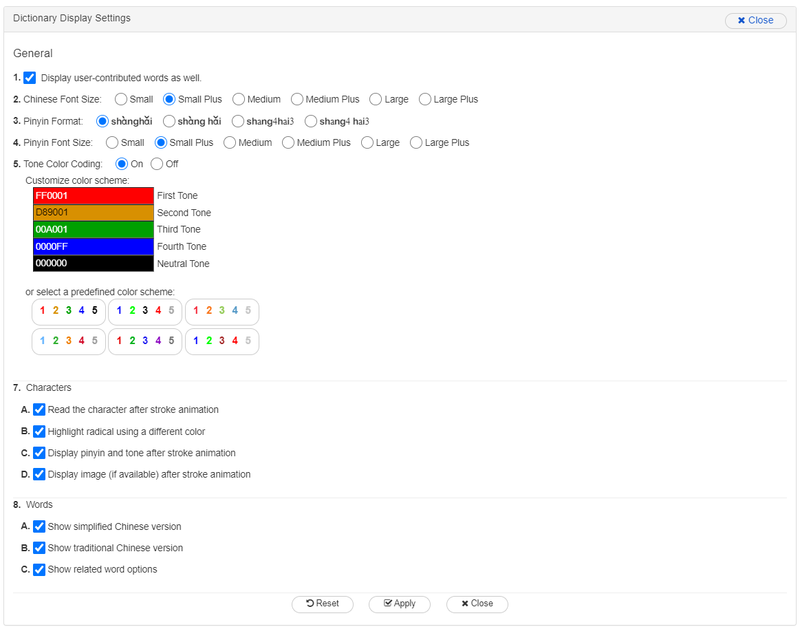 Click the "Display Settings" button, which is on the upper-right corner of the page. 4. Click the "Apply" button to apply the changes and click the "Close" button to close the view. If you want to reset the settings to the default values, click the "Reset" button and click the "Apply" button. 30. Can the system show me how to write a character stroke-by-stroke interactively? Once a character is selected, the animation will start automatically. You can click the character in the center box to write the character stroke-by-stroke interactively and listen to stroke names. When all the strokes for the character are written, it will start over again. Alternatively, you can click the "Stroke Forward" button below the animator to write the strokes interactively. After the character is written, the system plays the pronunciation of the character automatically. 31. Can you tell me how to export the character stroke sequences? I would like to incorporate them into our Chinese teaching materials. When a character is animated on the Chinese English Dictionary page, you will see a few buttons below the animated character. Click the "Export Stroke Sequences" button to export the stroke sequences of the character to a PNG image. You can also directly use the Chinese Character Stroke Sequence Image Generator to generate the stroke sequences of any Chinese characters. 32. How to use the Chinese English dictionary? To look up a character by Pinyin, you can use "Pinyin with tone notations", e.g. wo3, or "Pinyin with tone marks", e.g. wǒ. If you are not sure about the tone, you can use "fuzzy Pinyin" (Pinyin without tones), e.g. wo. When you use Pinyin with tone notations, use v for ü, e.g. lv3 for lǚ, and the number 5 for the neutral tone, e.g. ma5. Similarly, when you look up a Chinese word or phrase with Pinyin, you can use "Pinyin with tone notations"(e.g. bei3jing1 or bei3 jing1), "Pinyin with tone marks"(e.g. běijīng or běi jīng), or "fuzzy Pinyin"(e.g. beijing). Note when you use fuzzy Pinyin to look up words or phrases, make sure the Pinyin is one English word (no spaces between the Pinyin of the individal characters). If you know a character and the character has the radical you are going to use to look up other characters, you can show the character on the Chinese English Dictionary page and click the "characters with same radical " link to look up the characters with the radical. Like Chinese character radicals, character components are the building blocks of Chinese characters. There are about 1,000 unique character components in the standard Chinese character set of mainland China. Most of the components are also standalone Chinese characters, but some of them cannot even been displayed on your computer or tablet because they are not included in the unicode character set. To look up a character or word by English, simply enter an English word or phrase, for example, school or pay attention to, to the search box and click the "Search button". To view the details of a single Chinese character, you can simply enter (or copy and paste) it into the search box and hit the "Search" button. For example, 你 and 好. In addition to the character details, the example words and sentences will be shown below the animated character. You can mix English and Chinese characters or word in your search query. The English and Chinese can be separated by a comma, space or asterisk. For example, 电,computer, 电*computer or 电 computer. 33. Are there stroke order differences between simplified and traditional Chinese characters? Yes. you will notice minor discrepancies when you compare textbooks from mainland China and Taiwan. In this system, the stroke orders for simplified Chinese characters are strictly based on 《现代汉语通用字笔顺规范》 (Modern Chinese Commonly Used Character Stroke Order Standard) published by 国家语委和中华人民共和国新闻出版署(China National Language And Character Working Committee and General Administration of Press and Publication of the Peoples' Republic of China) in 1997. For traditional Chinese characters, which are used in Taiwan and Hong Kong, Arch Chinese follows the standard issued by Taiwan Ministry of Education. 34. What is chinese character etymology explorer? 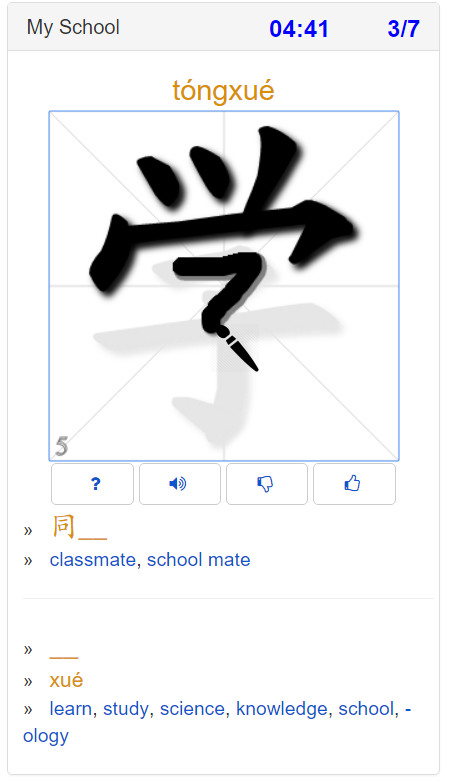 On the Chinese English dictionary page, As an integral part of the Chinese character animator, the chinese character etymology explorer is shown below the animated character. The character etymology explorer shows the composition of the character. It allows you to drill down into the character components one level at a time. This feature can help you understand what components a character is made up from and how characters are related to each other. When a character is animated, the first level component(s) and radical are displayed automatically. Radicals are displayed as in blue and non-radical components are displayed in black. If the component can be further decomposed, you can click the component (or the plus icon) to expand it and view the components of the component. The Pinyin and English definitions are shown next to the component or radical. You can also double click a component or radical in the explorer to view more detailed information, such as stroke order, character structure and pronunciation, etc.